I love to crosstitch, but whenever I finish a project, I wonder what I am going to do with it. One day, I was wandering Hobby Lobby and saw a pillow that was embellished like the one I made with buttons and random stitches. It caught my eye because it was, of course, made with scraps of different fabric. I clicked a picture so I wouldn't forget and kept it for later. I decided to make another throw cover. 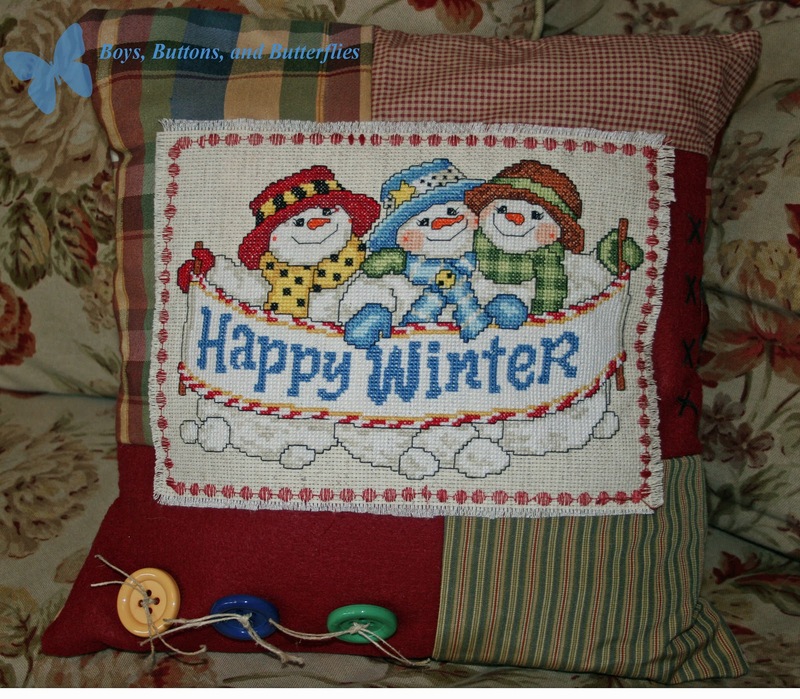 Storing pillows are a pain and it is much easier to just recover the same pillow! I made the cover like a sham so it is easy to take off after the season is over. I pieced the scraps of cotton, felt, and upholstery fabric and then stitched the crosstitch project right on top with an embroidery stitch on the sewing machine. I frayed the remaining edges of the Aida cloth (linen colored). Added buttons tied on with twine, and then added a row of crooked crosstitch stitches with yarn (on the right side).